Line bottom of two 10x15-inch pans with non-stick tin foil or parchment paper sprayed with baking spray. In a large bowl, beat eggs on medium high speed using an electric mixer for about 6 minutes, until pale yellow and thick. When you lift beater, eggs should fall in a ribbon. Add cake mix, water, and oil and beat on low speed for 30 seconds. Increase speed to medium and beat for 1 minute. Use Betty Crocker™ Gel Colors to color one bowl of batter purple, another green, and another yellow. Pour batter into individual disposable pastry bags or large zip-top bags. Snip the tips off the bags and begin piping really thin layers of colored stripes at an angle across one pan. Start with a purple stripe, then add yellow, then green. Continue until you fill each pan with stripes. Bake for about 10 minutes, until cakes spring back when touched. Flip cakes out of their pans, peel off the parchment or foil, flip over onto a clean piece of parchment paper and immediately roll up the cake along with the parchment paper. Tape ends to secure the roll and let it sit at room temperature for 10 minutes, then refrigerate for one hour. Filling: Mix together the Betty Crocker™ Whipped White Frosting and the whipped topping. When the cakes are ready, carefully unroll, peeling the parchment away. Spread half of the frosting over top of each cake, then re-roll. Refrigerate until ready to serve, then cut into slices. 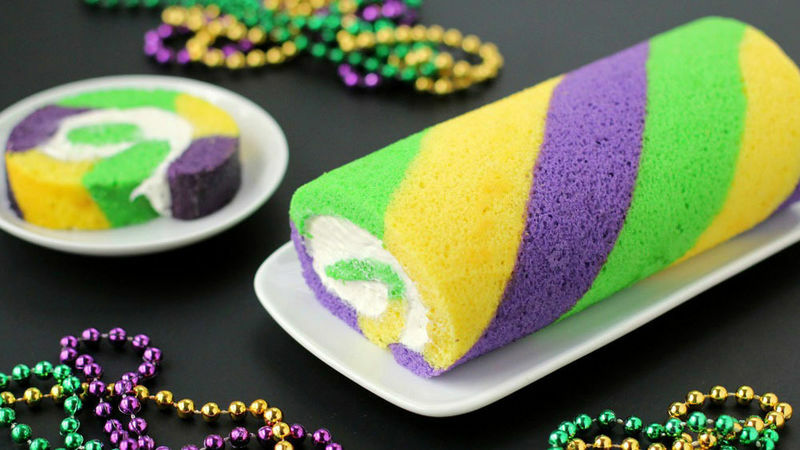 Break with tradition this year and serve a Mardi Gras King Cake Roll for dessert. These cake rolls are bright and colorful, just like the original with stripes of purple, gold, and green. But unlike a traditional king cake, these are baked flat then rolled around fluffy white frosting. Have fun hiding a plastic baby or bean inside, then the person who finds the surprise will supposedly be blessed with good fortune all year! Start by lining two 10x15-inch baking pans with parchment paper or non-stick tin foil. If using parchment, spray it with baking spray. To make the cake batter, begin by beating the eggs on medium high using an electric mixer for about 6 minutes, until they turn pale yellow and fall in a ribbon when the beaters are lifted out of the bowl. Add the Betty Crocker™ Super Moist™ White Cake mix, water, and oil and beat the cake mix on low speed for 30 seconds, then on medium speed for 60 seconds. Divide the batter equally among 3 bowls. Use Betty Crocker® Gel Colors to color one bowl of batter purple, another green, and another yellow. Pour the batter into disposable pastry bags or large zip-top bags. Snip the tip off the bags and begin piping really thin layers of colored stripes at an angle across one pan. Start with a purple stripe, then add yellow, then green. Continue until you fill each pan with stripes. Bake for about 10 minutes, until the cakes spring back when touched. Flip the cakes out of their pans, peel off the parchment or foil, flip over onto a clean piece of parchment paper and immediately roll up the cake along with the parchment paper. Tape the ends to secure the roll and let it sit at room temperature for 10 minutes, then refrigerate for one hour. Just before the cakes are ready to come out of the refrigerator, mix together the Betty Crocker® Whipped White Frosting along with the whipped topping. When the cakes are ready, carefully unroll, peeling the parchment away. Spread half of the frosting over top of each cake and re-roll.